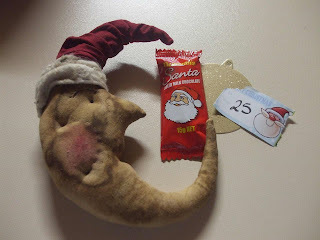 Fee's Little Craft Studio: Stitching Update & Advent Swap Time !! It is such a busy time of the year and as I work in the Hospitality Industry it is even more so but I am still maanging to get a little stitching done each night - It keeps me sane I am sure - Or am I really not sane? 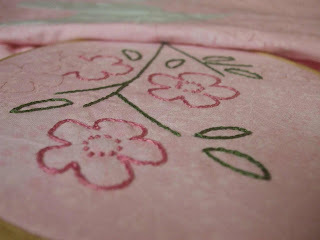 Who knows but I know I look forward to my little bit of stitching time each evening. I am progressing slowly with my "Birds of Happiness Quilt" (Above). I have a long list of gifts to make and am making some of the little girls in my life an overnight bag - This one is for little Emma....... Who I know is going to love her very own little bag to take to her Nan's for sleep overs. 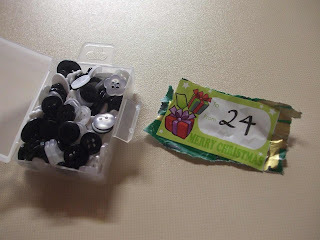 The advent swap is so much fun - I am loving opening a gift each day over coffee - I can see so many of you around blog land are having a great time and have made a new friend. My partner is the gorgeous Lizzie. This is what she made for me for the first day - He has pride of place on my mantle. And buttons this morning - One can NEVER have enough buttons...... Thanks so much Lizzie. What fun!!! I love your Santa moon, he's so cute :o)!! Dear Emma is going to LOVE that bag for her sleepovers with you, what gawjus colours - so bright and sunshiney :o). Love the santa moon too! Gorgeous Butterfly, Emma's going to love it! 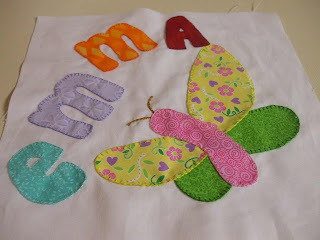 Love your stitching....so pretty...and the bag for Emma, how cute! Your santa moon is really neat, and the buttons are great - can't have too many of those! The swap has been so much fun! I can't believe I just opened day four gift! I loved the Santa moon!